7mate has set the date for Bogan Hunters, the new comedy from Logie winner, Paul Fenech. 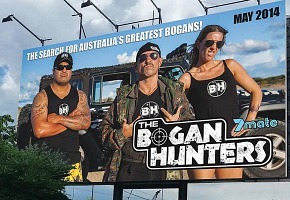 From the creators of Housos & Fat Pizza, The Bogan Hunters! An Australia wide hunt for our greatest bogans in their natural habitat. It will premiere Tuesday, May 13 at 9.30pm on 7mate. Considering the show is rated MA15+ it was a stupid decision to censor the coarse language given every second word uttered by the people featured on the show was some form of a swear word. Was a big fan of Housos – so bad it was good . Gotta love Shazza and Vernessa – now she was one scary “lady”.